PrintShopsCanada.com is designed to help businesses source and select local printers within Canada. The staff is working to make their listings as comprehensive as possible, covering print shops of all sizes and capacities. From specialty and digital photo finishing print shops to large run commercial printers. The web site allows print shop owners and operators to list their company completely free of charge, and to receive quotes from the site with no delay. The major challenge in this project was to research the print industry and it’s current online presence. Online print shops are battling for dominance of search results, while alienating the local physical print shops. Competition is very high and the user is very selective. Being involved in this project from it’s conception allowed our team to apply all aspects of SEO to the design and code. The dynamic content management system allows for user generated content to be used in the optimization of the site. The easy to follow navigation structure promotes user interaction, while the semantic design of the pages allows for constant growth and accessibility from mobile browsers. Search Friendly URLs and deep links build a tightly knit web of internal links and a very easily crawlable web site. To date there are over 400 companies listed in the web site, and it averages 35 quote requests on a daily basis. Over 95% of the web site traffic is generated by search results while the unique visitor count is increasing at a steady rate of 15% per week. 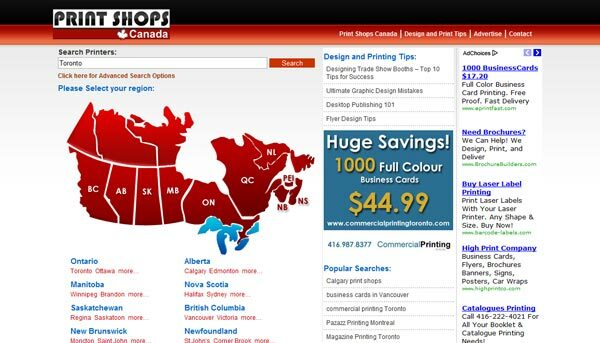 PrintShopsCanada.com is at the top of search results for over 750 regional, targeted and broad key phrases.